Kainuu Health District organized a system testing for Ambulance Data Connectivity in Kainuu region (Central-Eastern Finland) during the summer 2013. This is a free to use summary of the actual tests, results and summary with suggestions. The significance of a special vehicle router system is underlined. Installed in the vehicle. Goodmill w24e-RR router with external magnet antennas. The connection via the router to the computer is enabled through a WIFI Access Point connection. Computers used in this test were 2 laptops. Second tests used Effica Health Care application by Tieto on the Laptops. This testing was carried out on the Windows 7 operating system with 3G USB modem and the router. Both 3G modems used DNA's network. Effica testing was carried out using a test environment which had the same IT requirements as the proper usage environment Effica would have. The programme requires a non-stop wireless network connection and does not allow any interruptions in the Wifi connection while the registration is being carried out. 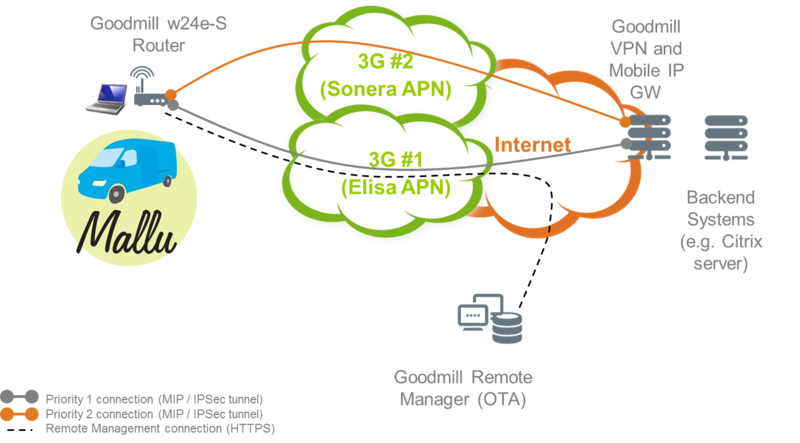 Citrix remote desktop enables using Effica with a suboptimal internet connection. Effica runs on the server and there is a desktop view on the computer of the programme. With CITRIX, Effica does not sign the user out if the internet connection is interrupted for a short period of time. Safemove software is needed for creating a password secure connection and changing connection without interruption. When the connection is directed from the 3G modem to the router it causes the IP address to change - which would result in losing the Effica network connection. A mobile IP address is created by the Safemove software, allowing the IP address to stay the same, ensuring the internet connection does not get interrupted. Safemove software has vehicle router installed in as a priority connection to enable connectivity inside and close to the vehicle. When the WiFi connection to the vehicle is cut, the computer automatically starts using the 3G modem. In the first stage only the connection speed and the reliability was tested for Effica. At this stage only a router and a computer with a Windows XP operating system was used. The road test was mainly done using a moving vehicle. When the connection was poor the vehicle was brought to a halt. The reliability of the connection was tested simply by running continuous ping-tests. Ping is a TCP/IP protocol tool which tests the reachability of a certain specified device. Ping sends an ICMP echo request package to the device, which the remote computer responds to with its own echo reply package. Ping tests were sent to the Google server address 8.8.8.8 using the Windows command line. The upload/download connection tests were carried out using http://speedtest.net. The testing methods were the same as in the road test. In each test situation the vehicle was parked about 10-20 metres outside the entrance. A tiled detached house in Vuolijoki. During the second stage the suitability of Effica for First Responders was tested. The reliability of the internet connection was very good. The connection was not offline for more than ten seconds at a time even in the most remote areas. When the connection was poor the car was stopped which brought the connection speed up again. The minimum connection speed was 1Mbit which is high enough for Effica to function well. The connection speed was also periodically tested using a single 3G modem without the router. This showed that connection speed was very low outside suburban areas. Effica would not work in these areas. The WiFi connectivity was tested from laptop to the vehicle. The connection to the vehicle router was not interrupted during the whole test period. The vehicle was parked ~10 metres from the main entrance. These both connection speeds are sufficient for Effica. The vehicle was parked right by the patient tower, the distance to the car was ~20 metres. The WiFi connection from laptop to the router was cut almost instantly when entering the building. The vehicle was parked ~10 meters from the main entrance. The connection was lost when entering the building, ~10 meters from the building’s entrance. Vehicle was parked ~10 meters from the main door. The connection was lost in the bathroom as this was farthest from the car. This was likely due to the concrete bathroom wall. The connection was also tested using a single 3G modem. The connection speeds were better using a 3G modem in the laptop inside the flat. The vehicle was parked circa 10 meters from the main door. The laptop WiFi connection remained uninterrupted. Not much variation on the connection speed. The connection cannot be guaranteed in all locations, but when in the near vicinity of the vehicle the CDMA450 connection is very comprehensive nationwide and therefore the connection is fairly reliable. A router fixed inside the vehicle is needed when using Effica. This enables a reliable and comprehensive network. An additional laptop 3G modem connection is needed when using Effica in tall buildings and far away from the vehicle when in suburban areas. The Effica test environment stayed active and recordable throughout the route. The WiFi connection was active and operational the whole time. Downloading and uploading information went smoothly and without any major interruptions or twitching. The same Effica session was used throughout the road test. At one test point along the Lahnasjärven Road Effica was working even at ~100 metres from the car. For test reasons there was an inbuilt WiFi antenna in the car which probably shortened the range. A normal setup would be an outside antenna. When tested outside the WiFi range, the laptop used Effica using 3G modem although connection was in this case very slow. A speed test for the 3G modem resulted in ping 875 ms and download 0,02 Mbit/s, whereas the router received ping was 85 ms and download 1.08 Mbit/s. The car was parked in the same spot as in the speed tests, ~10 metres from the main door. When entering the room that was furthest from the car, the connection automatically switched over to the 3G connection. There was virtually no difference in the recording once this happened. The connection automatically switched to the 3G modem and recordability remained the same. The testing continued in the stairwell up to the 4th floor and recording of Effica was also working inside the lift going down. Effica works faultlessly using this setup. 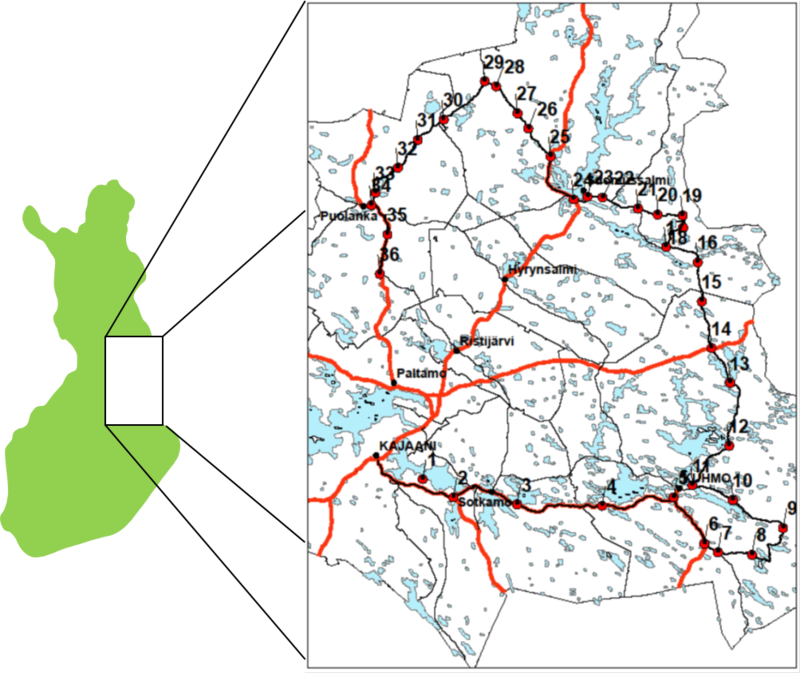 Switching between connections is unnoticeable to the user and it is likely to be sufficient for Effica over the whole Kainuu region. The connection to Citrix was lost a couple of times but this was due to the user. The same session was still open after logging back into Citrix. So even though the connection was lost in the middle of recording, the data was not lost. It is possible to get the Effica patient database working reliably in ambulances. 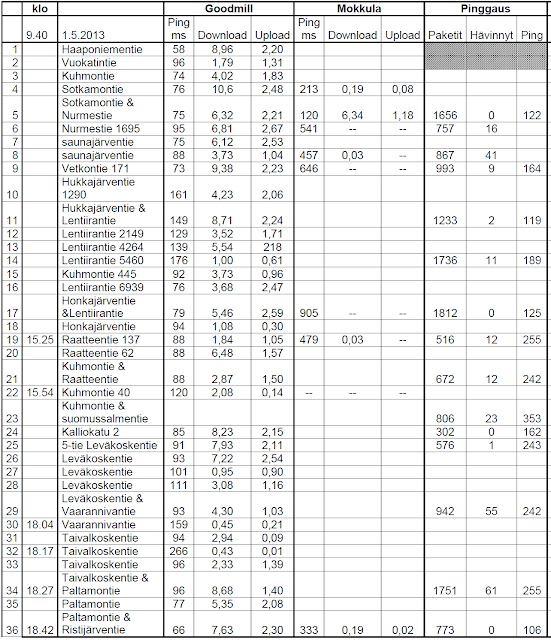 The router reliability and connection speeds are sufficient in and around Kainuu region. On top of the router, a 3G modem connection is needed because the WiFi connection does not work through thick walls or at distances greater than 100-300 meters from the vehicle. The Safemove software from Birdstep Technologies Oy is also needed, as this enables the switching of the router and 3G modem connection to ensure that the Citrix connection is not lost. The Mallu vehicle is a new type of mobile healthcare service that is used in remote regions where these services don’t exist. The objective is to introduce more advanced services to locations that don’t have a dedicated healthcare center. The customers include all community members, but the largest customer group is elderly people that have problems of travelling to the locations of stationary services. The first pilot tests in 2011 showed that as many as 65% of the customers were aged 65 or older. The Mallu vehicle provides primary nurse and pharmacy services. Special health related theme days are also organized using the vehicle. The vehicle has a fixed route and the target is to visit each dedicated site every fortnight. The time the vehicle is in one location varies from one hour upwards, depending on the need. The nurses provide services like ear rinsing, stitch removal, prescription renewals, vaccinations and other injections. Blood pressure monitoring, blood sugar level sampling and related advice are also included, while some quick sampling like INR is also performed in the van. 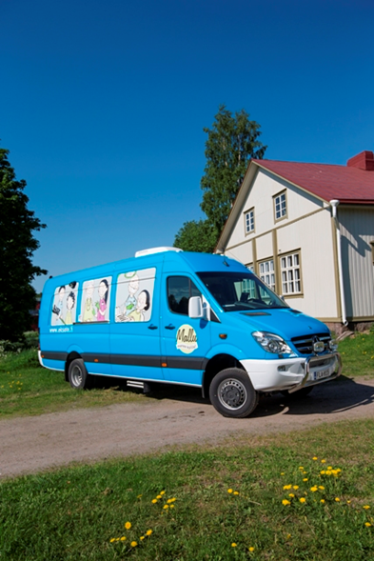 The broadband connection in the vehicle enables the usage of Eksote's regional health district patient register, so that all patient specific health issues can be monitored and reported online. Some dental services can be included depending on the equipment installed in the vehicle. One of the main requirements for the services is an always online data connection that is guaranteed to function in more remote locations. The Goodmill managed router system meets the challenge. The Mallu vehicle is equipped with a router that includes up to four different commercial mobile broadband connections. 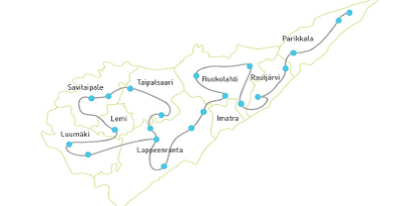 In current operations along the predefined routes, Eksote uses two SIM-cards from the two main operators in Finland. The solution brings all the health district’s databases to the vehicle over secured VPN tunneling. The van then operates like any other connection inside the hospital or healthcare center with similar rights and capabilities. This also enables more modern services like live video streaming from the van, enabling doctors consultation on demand. The total cost for the vehicle including salaries, vehicle rental and IT infrastructure are €115,000 per year. With a single customer’s cost between €52 - €104 per visit, the all costs of the service can be covered. 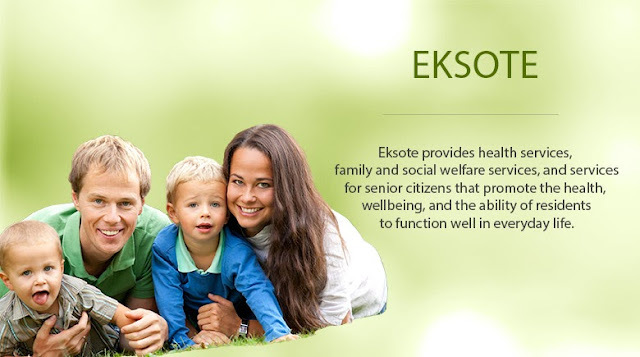 This is obviously a very interesting value proposition for Eksote. As the costs of health care are rising in general, a mobile service unit is a way to deliver services to more remote locations. A modern IT infrastructure is needed to support the service, which requires secure access to databases for medical records, electronic prescription databases and so on. The Goodmill managed router solution is a perfect building block and enabler for this. With always online broadband, imagination is only the limit to expand and upgrade the services in the future.